The above photo shows the decking taken from HMS Ganges broken up at Castles Yard at Cattedown Plymouth in the early 1930s. The original decking was later supplied to the proprietors of the Burgh Island Hotel located off the south coast of Devon. 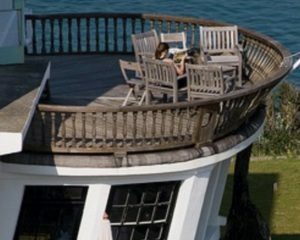 The decking still survives to the present day and can be viewed when visiting the island or residing in the hotel. It is another testament to the enduring qualities of teak, especially those salvaged from the famous wooden walls of England and the Royal Navy.